Included is our 30mW Twinkling Star Laser Pen included with a lens to project a star pattern anywhere you go. 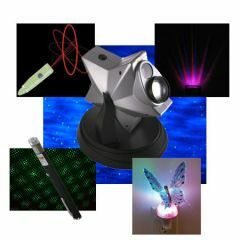 To accompany your Laser Pen we also include a Handheld Disco Rave Laser Pointer—when it's party time, you will be ready to dance, dance the night away with tripy disco patterns projected right from the palm of your hand. When it is time for the party to wind down, or you just want relax in peace and quiet, flip on the Laser Star Projector. This top-selling item is used in over 10,000 homes across the US and creates a serene starry night sky that can be used in any room of the house or any venue. To add the final touches to your newly enhanced décor, we include two unique night lights that both create great calming effects for sleep and provide the perfect soft light to find your way around the house. Furthermore, with their changing LED lights your imagination is sure to run wild. Don't miss this opportunity to enhance the ambiance of your next social event or family gathering. Grab your Laser Projection Value Pack and save yourself over 20%!